Nathalie Léger claims to have begun Suite for Barbara Loden as a brief entry on the American actress and director Barbara Loden for a film encyclopedia. Loden was married to the filmmaker Elia Kazan, had a brief acting career, and directed one movie, Wanda, in which she played the title role. Wanda was based on the true story of a woman drawn into a bank robbery. Her accomplice tells her that he will kill her and then himself if the heist goes wrong. Instead, he’s shot to death by the cops, and she is left to face justice alone. Wanda is a figure of overwhelming passivity, framed in the first shot of the movie as a tiny figure that dust “absorbs and dissolves” as she picks her way past a blurry pile of slag. She is an unresisting, pathetic creature, so panicked by her robber boyfriend’s instructions that she can hardly memorize them. She has them written out in a list: “14. Put the money in a bag. 15. Go to the car and leave.” Léger, assigned to write about Loden for the film encyclopedia, becomes obsessed with Wanda, and instead of finishing her entry, embarks on a study of coal mining and hair curlers, Polish immigration and the history of the self-portrait, spiraling out from her subject rather than honing in. Suite for Barbara Loden comes across as a dream, grounded in the women Léger researches but flowing into aspects she brings to life through fiction. She quotes Loden in an interview about her role in the Arthur Miller play After the Fall. Then the scene takes up as the door closes on the interviewer, and Loden sits in her dressing room. “She could hear noises backstage, the dresser going back and forth carrying costumes between the dressing rooms, the squeal of hangers on clothes rails, the echo of footsteps in the wing muted by thick carpet . . . ” The point of view has shifted without transition, a hallucinatory transposition of the narrator for her subject. Léger paints the bleak landscape of Pennsylvania and an improbable interview with the elderly baseball great Mickey Mantle with the same hypnotized attention, as if moving through the vacuum a deep wound has made. The book absorbs in its absorption, its willful fixation on a subject she should have passed over altogether, or at the least done less with. 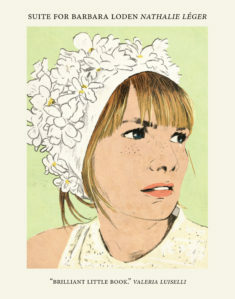 “It was understood that it was easier to fail than to succeed,” Léger writes, “the implication being that the most effective way to succeed was to fail.” Though she has failed her editor’s request to “stick to the subject” of the encyclopedia entry, the book is a quiet victory, reclaiming Barbara Loden’s persistence and nerve even as she is denigrated and misunderstood. Angela Woodward is the author of the novel Natural Wonders, winner of the 2015 Fiction Collective Two Doctorow Innovative Fiction Prize. Her other works include the collections The Human Mind and Origins and Other Stories and the novel End of the Fire Cult. She can be found online at: www.angelawoodward.com.